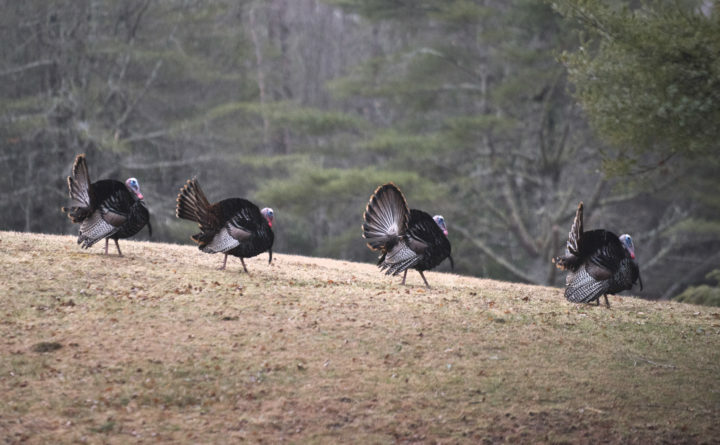 Male turkeys strutting in a Hampden field. — 1977: The reintroduction of 41 truly wild turkeys from Vermont takes place. — 1982: In-state trap-and-transfer begins. Birds are moved to Waldo County. — 1986: First limited hunting season. — 1991: Began rule-making effort to eliminate allowing pen-raised wild turkeys in captivity. — 1996: The trend of increasing the number of hunting permits continues, north and south hunting zones established. — 2001: Number of hunting permits continues to increase, A and B seasons established. — 2002: Nuisance Wildlife Policy adapted to specifically address wild turkeys. — 2007: Fall six-day shotgun season established. — 2010: Bag limits changed to one bird in the spring and one in the fall. — 2014: Spring season open all day after years of shutting off at noon; combined spring/fall turkey permit sells for $20, which includes two turkeys in the spring and two more in the fall.